In the spirit of the Twitter Friday Follow, the Book Blogger Hop is a place just for book bloggers and readers to connect and share our love of the written word! This weekly BOOK PARTY is an awesome opportunity for book bloggers to connect with other book lovers, make new friends, support each other, and generally just share our love of books! It will also give blog readers a chance to find other book blogs to read! 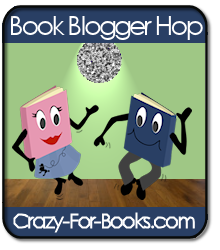 So, grab the logo, post about the Hop on your blog, and start HOPPING through the list of blogs that are posted in the Linky at Crazy-For-Books!! I do use a rating system for my reviews because I like to give a quick snapshot of my feelings about each book. I try to rate every book I review between 1 and 5, with 5 being as close to perfect as a book can be and a definite own and reread and 1 meaning I couldn't finish (the complete explanation is in the left sidebar). I use bookcases instead of stars, because I wanted to be a little different and as a librarian I'm surrounded by them everyday at woek. My rating system is definitely not perfect and sometimes I find it hard to rate each book, so I do use half bookcases as well. Eventually I would love to get a visual rating system. Hi! I found you through the hop. I'm a new follower. I hope you can check out my blog sometime! Thanks for following me. I can't believe I've missed such a beautiful blog. I'll have to check you out a little more when I'm not quite so tired. thanks for stopping by my blog. I love the header on your blog, and the background matches very well. I'm a new follower! Have a great weekend. Stopping by from the Hop too. Love the name, layout, everything! Can't wait to see more of a librarian's recommendations. Thanks for stopping by my blog! I think your rating system looks good! I'm trying to decide if I want to start one or not. I'm just hopping through thanks to the Blog Hop. I've been looking around your blog (so jealous you read Dead Beautiful!) and it seems like we have really similar reading tastes. I'm your newest follower. Have an awesome weekend! Hi! This is my first hop :) Really liking your blog, the arrangement of the columns is nice..I just changed mine and also the name of my blog! your header is so cool and intricate I am in awe!! Happy Hopping, reading and blogging! HI! I'm a new follower from the hop! I LOVE supporting librarians because I have worked with so many good ones, either while I was pres for our Friends of the Library chapter or doing book signings at libraries! Keep up the good work! Hi there, just stopping by from the hop and I like the look of your blog. Have a great Sunday!